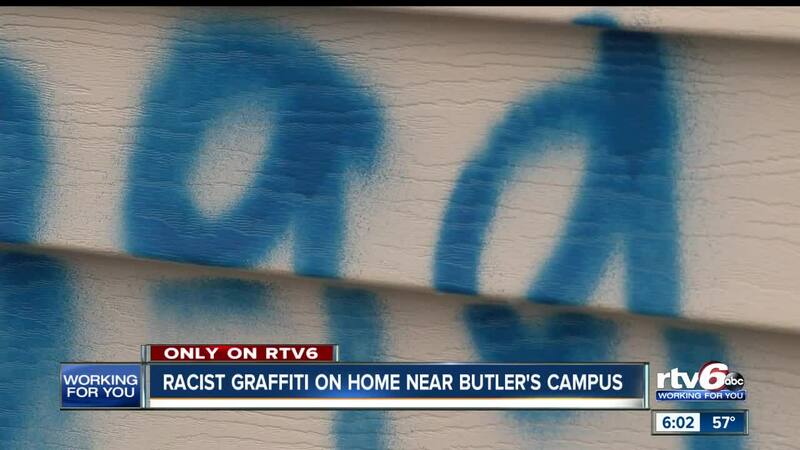 Racist graffiti on home near Butler's campus. INDIANAPOLIS — A north side Indianapolis woman went home Thursday to find racist graffiti on her property. Left shocked and scared, she wants to caution others about being more aware of what's going on in their neighborhoods. Sharley Bell says her family has lived in the Butler Tarkington Neighborhood for 50 years. To come home and see that someone had vandalized their garage is not just shocking, but she says hurtful. "I was like unbelievable - I couldn't believe it," Sharley Bell said. "I was like that is crazy!" On Thursday night Bell said her neighbor knocked on her door asking if she saw what was on her garage. "He didn't say what. So, I came around here with him to see," Bell said. "You know, it's like what could be on your garage? But then I saw the sign." Someone spray painted a racial slur with blue spray paint on her white garage door. "It is hurtful. It's very hurtful," Bell said. "I would think for anybody to see those words .....I think it's terrible." Bell still lives in her childhood home near 44th Street and Clarendon Street by Butler University where she takes care of her mother. Her neighborhood is full of long-time residents, but also a lot of college students. Throughout her time in the community, she's never had any issues like this. "It's sad that someone would do that. That it would be your thought process to be that mean," Bell said. "Of all the things to do - read a book, you know? Go to school. Just love one another." She did make a police report, and according to online records, it's not the only incident in the neighborhood. A fraternity down the street had also been vandalized earlier this week. Butler University police say they don't believe the two vandalism cases are connected. Bell is sharing what happened to her, so her neighbors are aware, but she's trying not to let it impact her life in a neighborhood she's always felt safe. "It makes you more aware of the world and people. How their feelings are…" she said. "What they think, and what they don't value as senseless - that's just senseless to do something like that and destroy someone's property. It is." According to BUPD Chief John Conley, both Bell and the fraternity's investigations are active and ongoing. BUPD have increased patrols on the south end of campus, where they say a majority of Butler students live. If you saw anything suspicious on Thursday afternoon or evening that could help investigators figure out who did this, contact Butler police.